The Lakshmi Shrine Bangkok is located in Gaysorn Plaza, an up-market shopping mall opposite the Erawan Shrine at the Ratchaprasong junction, an area famous for shrines of Hindu gods and goddesses. Lakshmi is the Hindu goddess for good fortune, wealth and prosperity. Her name in Sanskrit means aim or goal. She was created during the churning of the ocean of milk and became Vishnu's consort. It's believed that Lakshmi was reborn each time Vishnu was reincarnated. In 7th reincarnation of Vishnu to Prince Rama in the Ramayana epic, Lakshmi became his Princess Sita. For the location of the Lakshmi Shrine. In October, Deepavali or Diwali (rows of lighted lamps) the Hindu festival of lights is celebrated. Hindu homes are prepared to welcome Lakshmi, the household goddess, to bring wealth and good fortune. 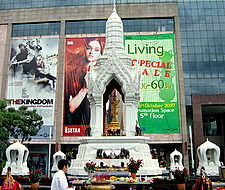 Why is the shrine dedicated to a Hindu goddess in this Bangkok upmarket shopping mall? Intrigued I decided to find out. Gaysorn Plaza is a circular building, with a bright and airy interior in white pastel that looks more like the lobby of a 5 star hotel. Floor after floor of the mall is filled with jewelers, plush carpets and fabrics, arts and craft, statues, sculptures, royal porcelain, glassware, cutlery, paintings, luxury watches, fine clothes and accessories. For the brand conscious, Bally, Burberry, Celine, Dior, Ermenegildo Zegna, Dunhill, Hugo Boss, Givenchy, Gucci, Louis Vuitton, are all under one roof. With all this luxury, it seems natural to adopt a deity who brings wealth and good fortune. But there's more to it than that. The 4th floor, where the shrine is located, was the office floor and not a public area. This is unusual as shrines are normally outside the buildings. However the security person gave a "wai" at the very mention of Lakshmi's name and led me to the roof garden. There above all those floors of wealth and opulence, stands the Lakshmi Shrine glittering in the sunshine. Lakshmi, completely in gold with a golden halo behind her head, is standing on a golden lotus in full bloom. The lotus buds in her hands sprout beauty and purity. From her four arms extend righteousness, desire, wealth and liberation from the cycle of life and death. 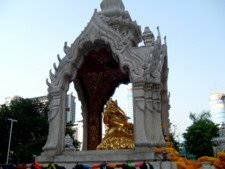 The shrine dedicated to Lakshmi is placed right at the corner of Gaysorn Plaza overlooking the junction. The Erawan Shrine is across the road. 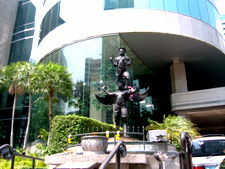 In the neighboring Intercontinental Hotel, the shrine to Lakshmi's consort, the Vishnu Shrine is in front of the hotel. There seems to be an order in the choice and placement of these shrines, perhaps to provide the balance and harmony so vital to the successful conduct of commerce. What's more, the Lakshmi Shrine is the only shrine around this junction dedicated to a Hindu goddess. The other shrines are of Hindu gods. If you're walking along the skywalk from Siam Square towards Chidlom station you may just be able to catch a glimpse of the Lakshmi Shrine, up on the roof garden of Gaysorn Plaza, standing like a guardian angel over the busy Ratchaprasong junction. 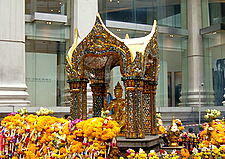 For the shrines of the other Hindu gods, please see Bangkok Shrines. Tour Bangkok Legacies – the e-book is my Smashwords edition of an-e-guide book for the independent traveller to explore Bangkok.